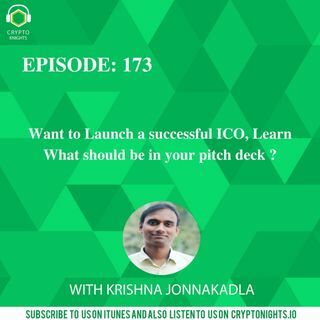 Episode 173-Want to Launch a successful ICO, Learn What should be in your pitch deck. how are you going to make money in the process of solving problems? Why you need a blockchain solution for this problem? Why your solution is awesome? and of course how your team is going to make difference? what kind of people you have in your team? A great pitch deck is the one which tells a story. Have a unique way of telling a story. The best pitch deck you can come up with should contain 10-12 slides, but if you need more slides just to explain your blockchain perspective don't hesitate to add few more. Krishna is a professional with over 20 years of global experience. He is currently the VP and Global Business Head of Swych Blockchain Labs that is targeting to change the space of global gifting and remittance with the help of the blockchain. Prior to Swych, he was the co-founder of Flit - The Fashion Locator in Town which he set up to scale independent and designer brands in Fashion and Lifestyle in India which is a $44 Billion market. Prior to Flit, he was the Co-Founder and Member of the Board at Mango Mobile TV, a successful online media company where he was responsible to scale the company's customer base to thousands across the world (excludes India). Mango Mobile TV is to date the largest library of Indian content with close to 10,000 Films, short films, songs, behind the scenes content and much more. He built Mango Mobile TV on a shoestring budget and had a successful exit when he was bought out by the largest stakeholder. Krishna has a long history of entrepreneurship and creation of thought leadership frameworks. His work in creating CXO mindshare and millions of dollars or new business and deals with Fortune 100 clients in North America won him the 18 Karat CEO Award for Consulting Mindshare and excellence. He brings significant leadership, innovation, and execution experience. Why this End to End ICO series? Because The less you know about the launching of an ICO, the more people you need to hire. Are you tired of reading those long articles about launching an ICO? Don't Worry We will save your reading time. Listen to our podcast on the go! Understanding the process of launching an Initial Coin Offering was never been Easier! Subscribe Today! Have a Question Comment Down Below.